Our company time line from when we first turned on our looms in 1954 to weave speaker covers. Our weaving business commenced operations in 1954. The first fabric to come off our looms was a fabric used for speaker covers. Our first composite reinforcement product was woven fiberglass. Boat builders and surfboard manufacturers were the earliest adopters to GRP so this was our market. This was where it all started for Colan in Composites. We are proud to still be the only weaver of composite reinforcement fabrics in the country today. The early seventies saw the first composite construction for refrigerated semi-trailers and truck cabs. Kevlar was invented by Dupont and Carbon FIbre was first introduced around this time also. The eighties saw a lot of development from our manufacturers, particularly on fibre performance. Many new applications were being developed both locally for high performance composites. In the early nineties the Australian Defence Industry provisioned the mine hunter project. The mine hunter vessels were to be made of composite construction as steel would be impossible due to the magnetic mines. These vessels incorporated a multiaxial design rather than the traditional woven roving approach. This was the beginning of a new standard in boat building that remains today. We bought our first Multiaxial Liba specifically for the job and now soon ordered three more. At the time we were one of only a handful of multiaxial manufacturers in the region. 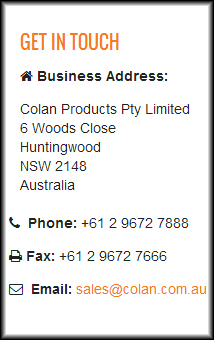 In 1996 The Company moved to its present location at 6 Woods Close Huntingwood. The Huntingwood factory was purpose built for Colan’s manufacturing requirements, optimizing the flow of processing raw materials into finished products. During this period we had a heavy focus on development. We expanded our range with new fabric designs offering alternate constructions and stitching combinations. We introduced new fibers in to the Australian market, namely Innegra and basalt. These fibers are still in their infancy and new applications are being developed. Today, Colan has become a multi-faceted composites business. We have expanded our manufacturing facilities to include an offshore operation and we have aligned ourselves with leading global suppliers. We've now launched an interactive online platform you can find information and place orders through. This is an exciting time for us. We appreciate the commitment of all the customers we have had the pleasure of dealing with over these many years. We look forward to working more with you in the future.